- the professional solution for customer loyalty and customer satisfaction. 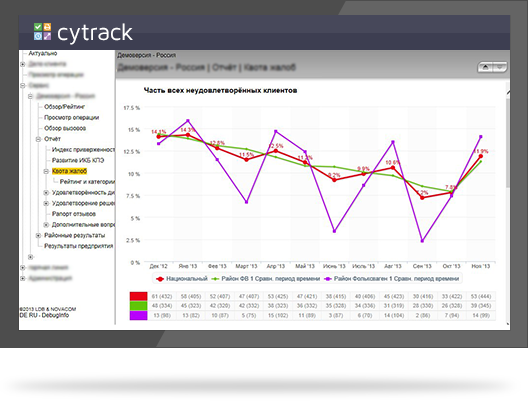 cytrack is an interactive, webbased application for complaint management and to measure and present customer satisfaction. After many years of experience in the field of market research and customer satisfaction and after engaging in constant dialogue with market researchers and clients cytrack is after being deployed in spring 2005 now used in many countries across the world. It is used as a comprehensive and sustainable customer loyalty strategy. These operational and strategic goals are increasingly representing very high requirements for the IT systems. Qualitative first class field work, highly skilled consulting personnel (with employment of a callcenter for acquisition of information). Optimised, short questionnaire which fulfils operational and strategic targets. Feedback loop(follow-up customer interview when dissatisfied). 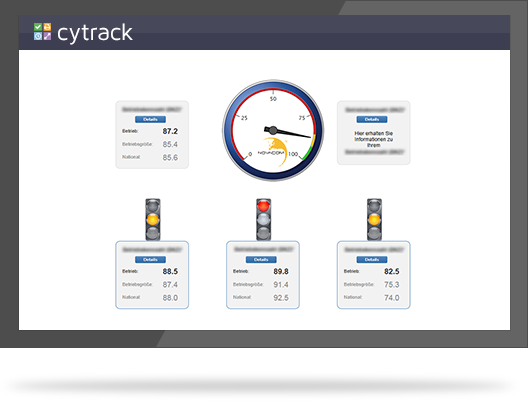 If cytrack is used in combination with the CATI-solution also developed by NOVACOM, all the interactions between the systems for the relevant requirements can be reliably fullfilled, because the systems were developed simultaneously for this purpose. 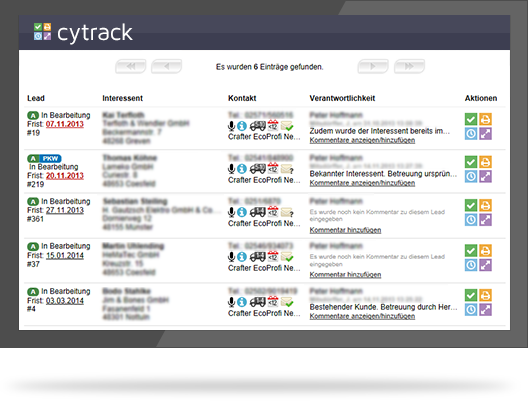 cytrack is subject to – just like ClientCall – a permanent evolution. Special attention is being placed on system stability, maintainability, operability and performance. 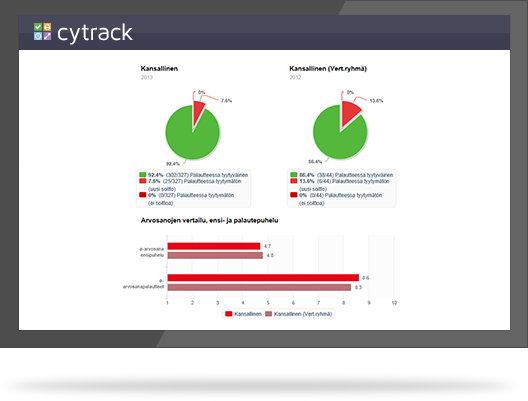 cytrack can be deployed regionally, nationally but also globally under one central administration. ClientCall – Call or be called? 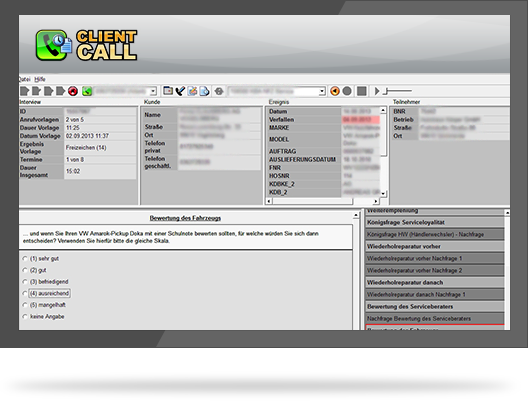 The connection of ClientCall to the CRM- and complaint management portal cytrack gives the client the possibility to review the results of the interviews directly after the call has ended, and the chance to react and act upon the customer requests. 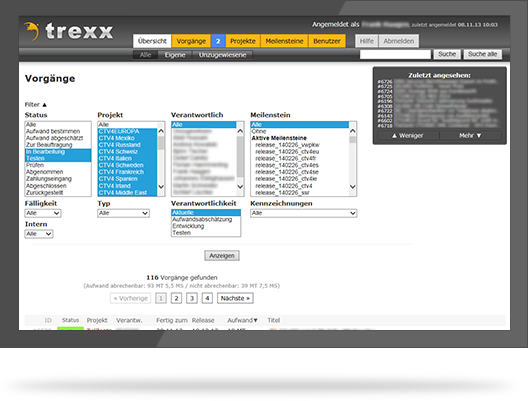 Database based, Open-Source Client-Server solution for für In- and Outbound-telephony. Windows- or Linux-operating system on the client side, linux on the server side. 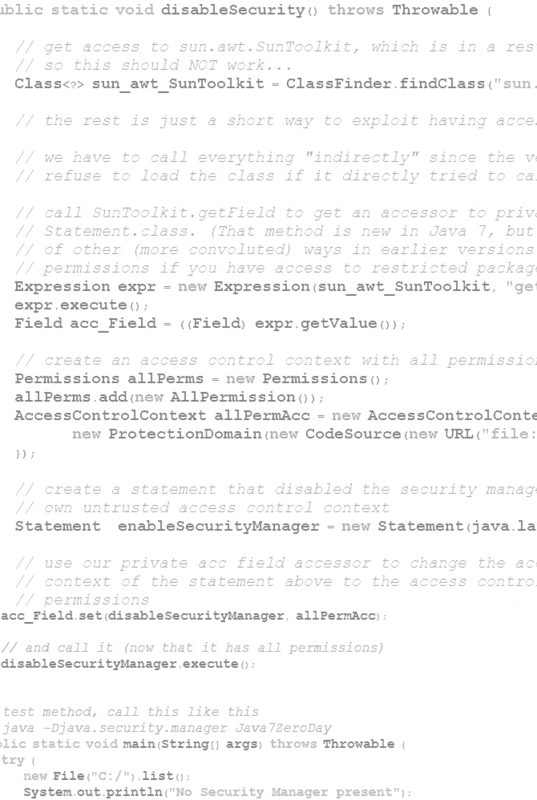 Security oriented Softwaredesign with encrypted data transfer. No Client-Installation necessary on the agent work station. Project specific monitoring and recording (creation of .ogg-Data) via Soundcard and universal telephone-hardwareadapter makes it possible to do comfortable location-independent monitoring in real time over the internet. Adjustable amount of projects, automatised controllable classification of customers, e.g. hundreds of dealerships. Subject data can depending on a wide range of attributes also be used comprehensively over different projects and campaigns. Dynamic and client dependent generation of questionnaires in run-time. In this way e.g the on the fly-Integration of additional questions in a questionnaire can be controlled through a contract administration tool. Flexible quota management. All address information can be employed in a quota definition. For example only women under the age of 30 in the postal code are 1xxxx, that have a have a 3 year old of a certain brand should be called..
during the run-time it is always possible to make regulative systematic adjustments. High Performance through C++ coding of Interview-Servers, Client and Admin. Ad-hoc Export of interview data during run-time. Revisionary secure and ISO-conform position of all relevant information in the data base. 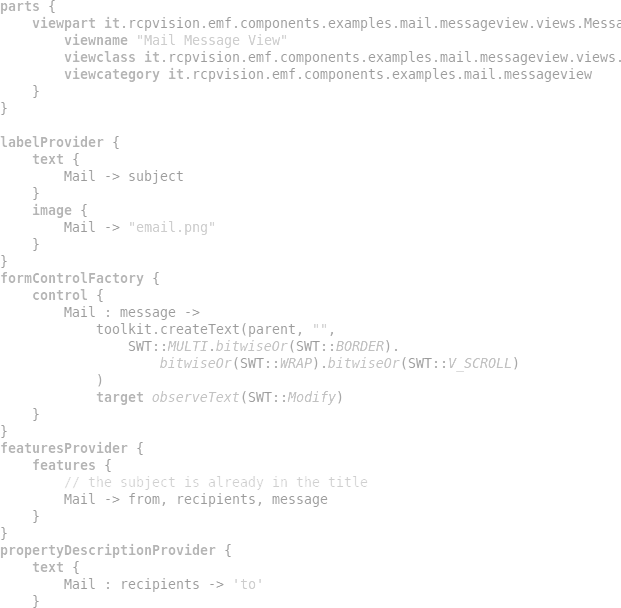 Agreements over the phone, important information per mail, error messages with screen shots per Fax - the horror scenario for every structured process. The employment of a ticketing system can be a great help, but only if the system is not even more complicated than the problem that is being solved. 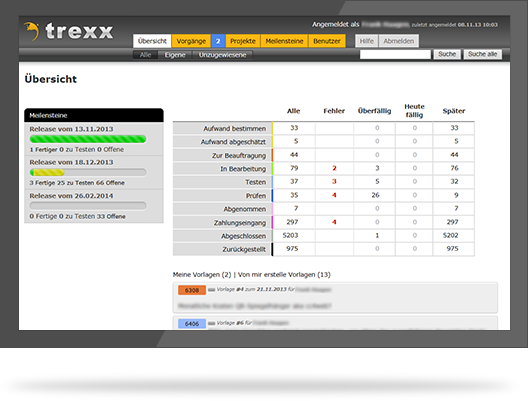 Therefore a few years ago we started developing our own ticketing system for our customers called trexx. The communication for support and error messages, and also change requests or totally new features is now being handled successfully and efficiently through trexx. A ticket goes through until nine states from deciding the work costs until the ticket is closed. There are responsibilities also on the customer side, templates can be personalised and scheduled and transfered to the calendar with iCal. It is also connected to the in-house time registration(and of course in-house development.) TimeCollect which makes it possible to do diverse reporting, especially concerning the automatically calculated available capacity for the next realease, over which the customer can gain access. Accounting is also incorporated and a modern Look’n’feel completes the ruby based tool, without which we couldn’t work. together – that was always the motto of Schtief. No fun unless everything is done together. 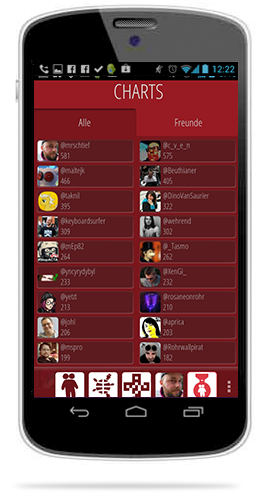 With the jemeinsam-App you can make staying close to your friends a game. Get Together, create togetherness. 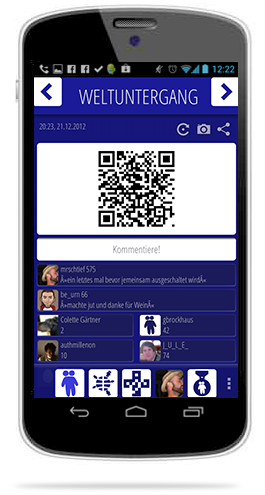 Together with your friends you scan the QR-Code and confirm that you are meeting in RealLife. In this way you can recharge your Together-Friendship-Bar. 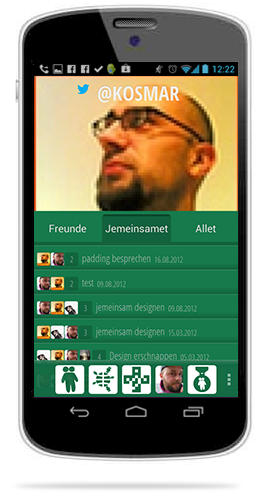 jemeinsam is the first RealLife Social Network. It only works when you actually meet up and do something together in togetherness. Cool and viral and maybe just a bit too complicated – but we still had lots of fun with it!